"Hello, hello, pay attention to the manager!" 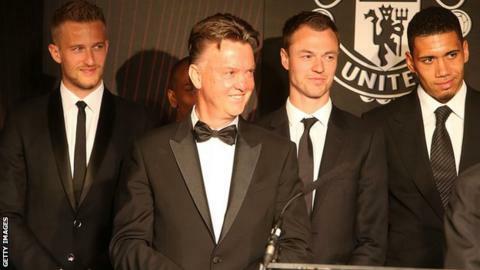 Manchester United boss Louis van Gaal produced what was described as the "greatest speech of all time" to steal the show at the club's player of the year awards evening. After Spanish goalkeeper David De Gea won both the Players' Player and Fans' Player of the Year accolades for a second year running, Van Gaal took to the stage live on MUTV. Recalling a team meeting at which captain Wayne Rooney said United could push for second in the Premier League, the Dutchman bellowed "yes" and punched the air. Repeatedly referencing the fact United had won 13 points from the first 10 games of the season, the 63-year-old described the club's fans as the "best in the world". After praising the players' spirit a number of times during a seven-minute monologue, Van Gaal said his team "could have been the champions" and were "very close", despite a 15-point deficit to title-winners Chelsea. Then, with presenter Jim Rosenthal wrapping up proceedings in Old Trafford's Manchester Suite, there was a Van Gaal encore. Returning to the stage and grabbing the microphone, he shouted: "Hello, hello, pay attention to the manager!" He then admonished those present for not applauding the female saxophonist, who he said had played "fantastically". When Van Gaal returned to his seat, MUTV presenter Mandy Henry said: "How do you follow that?" "I have seen a lady who plays the saxophone fantastically... give her a big applause"
Midfielder Juan Mata, who won goal of the season for his acrobatic strike in a 2-1 win over Liverpool at Anfield, said Van Gaal's speech was "fun". The Spaniard added: "I think he enjoyed it. Obviously we have a lot of meetings during the season. We know how he can behave." Former United defender Gary Neville tweeted: "LVG is cracking me up here. Great entertainment! One of the best/funniest 20 mins I've ever had!" Ex-England cricket captain Michael Vaughan described it as the "greatest speech of all time".